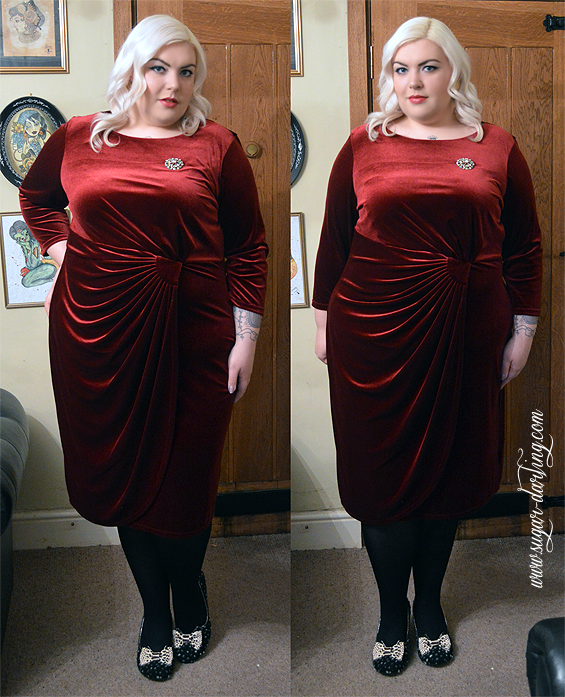 Visions of Velour - A Christmas Outfit Post - Sugar, Darling? Hi loves! Oh boy has it been a busy Christmas! There have been quite a few very stressful occurances but over all it has been really lovely, the worst having to be our oven breaking yesterday as I was about to start cooking a roast dinner for my family - thankfully my lovely mother in law let us drive everything over to their house to cook and then Pete drove it back for me to finish off the stove top cooking here. As you can imagine I was very close to bursting into tears when I realised that my giant 7kg turkey had no oven to go in so it was a good job my little sister and her boyfriend were here to cheer me up! Anyhoo, this was my Christmas day outfit which I wore to Pete's parents house. He actually bought me this dress as one of my presents but I had it early as I wanted to wear it to the Very Vintage Christmas fair which I did in early December. I got lots of compliments and people asking where it came from and everyone was really surprised to hear that it was from Bon Marche. I was actually surprised by it too, I spotted it in a shop window and instantly fell in love and then realised what shop it was. I have to say that Bon Marche have got some really lovely dresses in at the moment and they have a big sale on which includes this dress so you can bag one for yourself for only £25! The side drape of the dress is lovely and so flattering to a bigger tummy. The velour is lovely and soft and such a gorgeous deep holly berry red, and as an extra plus it is machine washable - my velour pencil skirt is hand wash only so I was expecting this to be too but it came out of a machine was perfectly. 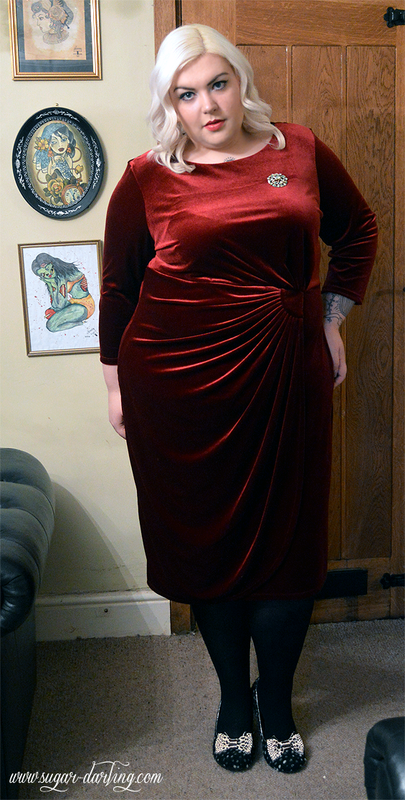 My only gripes are that I would have liked a prettier neckline, perhaps a v or wrap top and I had to adjust it slightly at the hips on the side with no draping as it wasn't shaped right for me and bulged in an odd spot, but this is more to do with my body shape than a fault with the dress! You can find the dress here in the sale and also grab these lovely shoes in the Irregular Choice sale here!